Longhorn cattle have been a part of the history of North America since 1493 when Spanish settlers accompanying Christopher Columbus brought the first few long-horned Iberian cattle with them to the Antilles Islands (Puerto Rico, Cuba, Jamaica, and Hispaniola). Beginning in about 1519, many of those cattle (which had propagated profusely in the interim years) were taken by Antillean settlers when they traveled to Mexico in search of gold and other treasures. Antillean cattle were landed all along the eastern coast of Mexico during the 16th and 17th centuries. The most popular port of entry was Vera Cruz, but they also came ashore as far north as Tampico (less than 200 miles south of the Texas border). From Vera Cruz, ranches were established quickly, and soon large populations of Iberian longhorns were seen throughout the Panuco Delta as well as south and west of the port of Vera Cruz. From there, long-horned cattle gradually migrated, with Spanish explorers, settlers, and mission priests, north along both the Pacific and Atlantic coasts. The first known cattle in Texas arrived in the early 1700s with Franciscan missionaries as they began to build a chain of missions extending through the San Antonio River valley and out to the present city of Goliad. Spanish expeditionaries brought sheep, goats, horses, and "horned" cattle on their overland voyages both as food on the hoof to sustain them during their travels and also as seedstock for settlers once having arrived at their destinations. 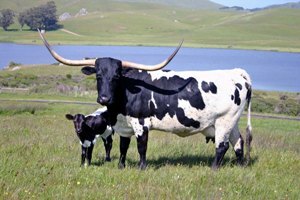 Between 1493 and the mid-nineteenth century, feral Longhorns flourished in the Americas, using natural selection principles to develop hardiness, disease resistance, ease of calving, strong mothering instincts, and other traits vital to their survival. What evolved was an animal which could survive in harsh environments, one which had sound legs and could walk miles to water, to breed, and to utilize available forage, and one which could also produce and raise a live healthy calf year after year. The evolutionary process, in which only the fittest could contribute to the gene pool, also produced a body commensurate with the availability of food, gave them hard hooves and lethal horns with which to protect themselves and their young, and provided them with a hardy immune system which made them largely resistant to disease. Furthermore, the cows developed excellent udders in order to be able to successfully feed their young in a harsh land of generally poor forage, and the bulls developed tight sheaths in order to avoid injury in the thick scrub they frequented. During the eighteenth and nineteenth centuries, the commercial importance of longhorns (since they were at that time the predominant breed of cattle) was to supply the hide and tallow industries of Europe and, after the Revolutionary War, of New England as well. Before the advent of electricity in the early 20th century, candles were the world's chief source of night light. Tallow, the main ingredient in candles, soaps and lubricants, was obtained by rendering animal fat. Hides were important to the shoe, boot and leather industries. Therefore, "Hide and Tallow" companies (as beef processing plants were then called) became the major users of cattle carcasses, first in California and later in Texas and other southern states as well. In the absence of refrigeration, meat was largely a byproduct and of little commercial value. During the memorable cattle drives, those millions of Longhorn bulls, cows, steers, and calves walked north along well worn trails and actually gained weight as they walked, all the while protecting themselves and their calves from predators, swimming rivers, and surviving desert heat and winter snows. The fact that they could not only survive but actually thrive under those conditions is a remarkable testament to the evolutionary advantages these animals had gained. While the cattle drives of the 1870s and 1880s have become romanticized and legendary, the greater influence of these drives was in the exportation of the "Texas Longhorn system." 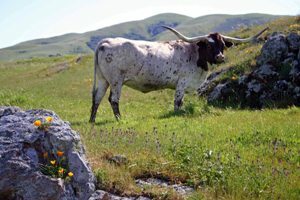 This system embodied not only the longhorn animal but also the management technique used in Southern Texas14 that was characterized by "allowing cattle to care for themselves year-round in stationary pastures on the free range, without supplementary feeding or protection. "15 While it worked well in the tropical climates of Mexico and south Texas, it was inadequate in the more hostile climates further north. The failure of this system in northern climates, plus the influence of "Cattle Tick Fever" (see below), resulted in the near demise of Spanish long-horned cattle in this country. Northern ranchers, who were enjoying relative success during those hard times by utilizing the British system of close penning and winter supplement feeding, lost faith in the longhorn. While it was probably unfair to blame the longhorns for the bad management practices of their owners, the fact remains that the "Texas Longhorns" were rapidly seen as scrub cattle that should be eliminated rather than propagated. The downhill slide of the breed was exacerbated by one of the strengths of the longhorns - their immune system - which now worked against them. Their immune system enabled longhorns to survive while carrying a tick on their hides which, in turn, carried the disease, Cattle Tick Fever. Cattle Tick Fever was devastating to British and other cattle that were not immune to it. When populations of other breeds began to decline because of this disease, that was the last straw and the result was large scale destruction of the nation's longhorn population. In a fascinating article appearing in the February, 1999 edition of the Western Horseman, Dwight G. Bennett, DVM, recounts the role of "Cattle Tick Fever" in the history of the demise of longhorn cattle. He attributes that phenomenon largely to pressures from other cattle ranchers intent on protecting their herds from the "Texas cattle" which were "poisoning their [pasturelands]" and killing their cattle. It turns out that the disease-laden ticks, engorged themselves with the blood of their host longhorn, then dropped from the cow, laid eggs on the ground, and died. The disease is carried on when the ticks complete their life cycle by attaching themselves to passing cattle. That explains why ranchers complained that the longhorns had poisoned their pasturelands. As noted by Dr. Bennett, Cattle Tick Fever was not just identified locally where longhorns were passing through. Indeed, it was recognized as early as 1868 among cattle breeders as far east as New York State who noticed their purebred British stock dying when Texas Longhorns were shipped into the state by railroad from the stockyards in Abilene and other railheads. As a result of public outcry throughout the country the market for longhorn cattle toppled, and, various states passed laws attempting to prevent the passage of longhorn cattle across their borders. Although the tick was later found to be controllable and Cattle Tick Fever has since been eradicated in the United States, those scientific advances came too late to restore the reputation of what had, by the mid 1870s, become, essentially, outlaw cattle. By the 1880s, after consumers had slaughtered millions of longhorns, the demand for higher fat content in both tallow and beef also played some role in the drop in the marketablility of longhorns. All things being considered the population of Texas Longhorn cattle went into a steep decline and by 1910 the breed, which only thirty years before had numbered well into the millions, was considered nearly extinct. In 1927 Congress (at the behest of conservationists and historians) appropriated money to establish a federal herd of purebred Texas Longhorn cattle. Over the next several years, two U.S. Forest Service rangers inspected over 30,000 head of cattle and found only 20 cows, 3 bulls, and 4 calves that were in their opinion purebred Texas Longhorns. These cattle were taken to the Wichita Mountains Wildlife Refuge near Cache, Oklahoma, as seed stock for what has become the "Wildlife Refuge (WR)" herd. Of interest, the WR herd was compiled only from "remote" herds and did not include any influence from six other purebred herds then known to exist (Marks, Phillips, Yates, Butler, Peeler, and Wright). Equally as interesting, no cattle were collected from California, Arizona, or New Mexico where there may well have been purebred herds still in existence. Most present day Texas Longhorn cattle are descended from those seven families, each of which had its own distinctive attributes. To a Longhorn producer today, it is vitally important to have an understanding of an animal's pedigree and the degree to which it has been genetically influenced by one or more of those families. In 1964 the first registry was established to perpetuate breeding records and confirm the purity of blood lines for breeders of Texas Longhorn cattle. Since that time, the numbers of registered Texas Longhorn cattle has soared and by the late 1990s it had exceeded 250,000. Breeders now exist in all 50 states as well as Canada, Mexico, and many other countries. 1. Dobie, J. Frank The Longhorns, 1941, Little, Brown & Co., Boston. 2. Dana, Richard Henry, Two Years Before the Mast, 1840; reprinted in 1869 by Houghton, Mifflin & Co. as "The New Edition, with Subsequent matter by the author"; Cleland, From Wilderness to Empire, A History of California - 1542-1900, 1944, Alfred A. Knopf, Inc.; Taylor, Bayard, Eldorado - or Adventures in the Path of Empire, 1949, Alfred A. Knopf, Inc.; Mora, Jo Californios, 1949, The Country Press, Garden City, NY; Edwards, The Diary of Philip Leget Edwards - The Great Cattle Drive from California to Oregon in 1837, published in 1932 by Grabhorn Press in San Francisco; Cleland, A History of California - The American Period, 1939, McMillan Co., NY. ; and other historical reference works which have been cited in an article which I wrote and published in July/August, 1998 Edition of The Texas Longhorn Journal. 3. Dobie, J. Frank, The Longhorns, 1941, Little, Brown & Co., Boston. 4. Mora, Jo, Californios, 1949, Doubleday & Co.
5. Jordan, Terry, North American Cattle Ranching Frontiers, 1993, University of New Mexico Press, Albuquerque, NM. 6. Jordan, Terry, North American Cattle Ranching Frontiers, 1993, University of New Mexico Press, Albuquerque, NM. 7. Jordan, Terry, North American Cattle Ranching Frontiers, 1993, University of New Mexico Press, Albuquerque, NM. 8. Jordan, Terry, North American Cattle Ranching Frontiers, 1993, University of New Mexico Press, Albuquerque, NM. 9. Jordan, Terry, North American Cattle Ranching Frontiers, 1993, University of New Mexico Press, Albuquerque, NM. 10. Jordan, Terry, North American Cattle Ranching Frontiers, 1993, University of New Mexico Press, Albuquerque, NM. 11. Dobie, J. Frank, The Longhorns, citing Smithwick, Noah, "The Evolution of a State, or Recollections of Old Texas Days", 1900, Austin, Texas, pages 289-291. 12. Brown, John "Road back from Legend", March/April 1998 edition of The American Cowboy. 13. Dobie, J. Frank The Longhorns, 1941, Little, Brown & Co., Boston. 14. Jordan, Terry, North American Cattle Ranching Frontiers, 1993, University of New Mexico Press, Albuquerque, NM. 15. Jordan, Terry, North American Cattle Ranching Frontiers, 1993, University of New Mexico Press, Albuquerque, NM. I want to give credit to Candy Judd for her editorial insight and valued input into this article.